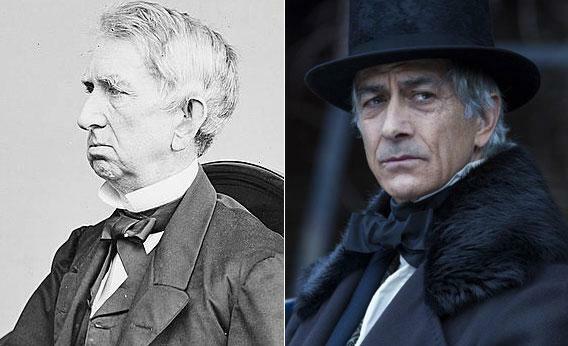 Why Is David Strathairn Missing From The “Lincoln” Death Scene? That famous line was spoken by Edwin Stanton, Lincoln’s cantankerous Secretary of War, as the President was pronounced dead on April 15, 1865. 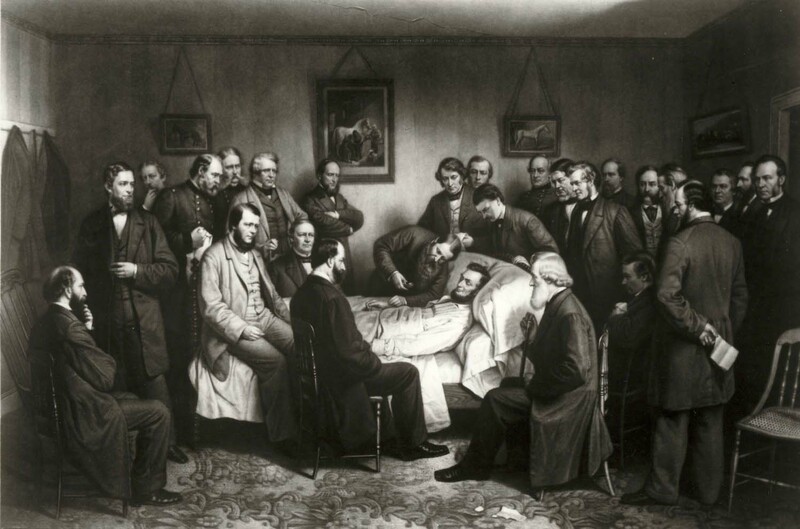 Surrounding the bedside were other members of Lincoln’s cabinet and staff. But someone important is missing. In Steven Spielberg’s film “Lincoln“, Stanton is portrayed by Bruce McGill. But where is Lincoln’s right hand man in his cabinet, and in the movie, Secretary of State William H. Seward, played by David Strathairn? Strathairn is not present in the scene because it would not have been historically correct to have him there. I thought the movie could have mentioned this, but maybe the filmmakers were running out of time. They might have also mentioned that Seward – missing from the Confederacy’s surrender scenes as well – had been very seriously injured nine days earlier trying to round up two runaway horses. 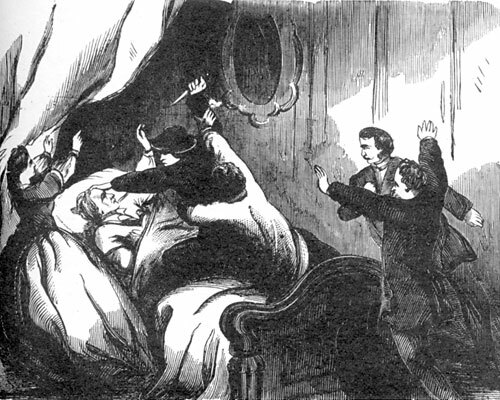 The attempted assassination of Seward. An intruder, Lewis Powell, posing as a messenger delivering medicine, broke into Seward’s home and assaulted two of his sons, his daughter, a soldier and a nurse as he tried to get to the bedridden Seward. Seward was repeatedly stabbed in the face and neck, and pretty much left for dead, as Powell escaped – stabbing yet another person as he fled into the street. Powell would later be captured and hanged. Though Seward recovered, and served another term as Secretary of State (during which he bought Alaska) under President Johnson, he was scarred for life. He was considered a bulwark in the fight against impeachment attempts against Johnson. Seward, a former two-term governor and senator from New York, left a legacy as one of America’s finest Secretaries of State. Despite the fact he was at one time a more likely candidate for President in 1860 than Lincoln himself, he became one of Lincoln’s most loyal advisers and trusted friends. Maybe it was better he was not a witness to Lincoln’s sad demise. It would have broken his heart. Is Vice President Johnson seen or heard of in the Lincoln film? Not that I know of. But he’s barely mentioned in the book the movie is based upon either.